Samanage is an award-winning IT service desk and asset management software. It won our 2017 Supreme Software Award and our Expert’s Choice Award. Samanage service management software is a solution that can instantly be deployed via a true cloud, SaaS based model. There is no hardware or software installation required, and no maintenance ever on your site. Samanage is also multi-tenant meaning a single, always new instance of software that lets customers enjoy the fastest time to value and unmatched user experience. Once deployed, Samanage automatically collects all IT asset configuration data, empowering IT with comprehensive reporting and alerts in a simple and elegant interface. The integrated service desk software allows users to submit requests online and provides the IT support desk with immediate access to related asset configuration, thereby expediting resolution time and improving productivity. You can read our detailed review of Samanage if you want to learn more about the benefits and features of the software. For IT teams delivering services across the organization, Samanage is the only Enterprise Service Management software that provides a platform to reimagine how IT can deliver value to the organization today by streamlining business service requests and delivery processes through remarkable visibility, a new class of agility and an excellent service experience to help you lead the way. Samanage provides organizations of all sizes the ability to deliver excellent IT service to their organization with an easy-to-use and beautiful design that allows the modern help desk to automate the mundane tasks across departments throughout the enterprise. Using the Samanage Service Desk, IT teams have the ability to reduce support workload, streamline processes, and deliver superior service. Providing an enormous advantage to IT departments, Samanage’s integrated IT asset management solution oversees the entire asset lifecycle, from the day it is provisioned until the day it is disposed. By tracking the asset configuration, operating system and software, physical location, as well as monitoring changes to the device, Samanage Asset Management provides an unprecedented level of visibility that goes far beyond the asset itself. Able to be deployed by a technician instantly across an entire organization through Active Directory using Group Policy or Domain Login Scripts, the Samanage Asset Management agent can be installed on any device with an operating system. The agent then reports back daily to Samanage with data points of interest regarding the asset’s performance, location and other key aspects. Samanage follows the Information Technology Infrastructure Library (ITIL) rules, which means it offers all the essential features required for the service support requirements of large IT operations. These include standard ticketing, and problem, incident, and change management. You can use Samanage to streamline your company’s delivery flows and service requests by providing all employees better visibility of their requests. It is easy for agents to quickly raise tickets which contain all the essential information. The main view shows all ongoing, pending, and resolved incidents. It can be fully configured to show important data such as due dates, sender, and receiver. The asset management feature provides you a complete view of the asset’s lifecycle from its purchase to disposal. You can view essential data on the asset such as performance, specs, and location. If you are using a BYOD (bring your own device) policy, you can track company laptops and mobile devices through Domain Login or Group Policy scripts. Samanage’s Dashboard offers deep insights on all IT-related incidents across your business. Values are presented in metrics, graphs, and key performance indicators (KPI) to help managers get the big picture at a glance. Samanage supports dual single sign-on (SSO) capability seamlessly. After signing on, users can be assigned the full range of roles and access levels according to requirement. If you don’t need the extra features, you can avoid paying for them during price quotation. Routine tasks can bog down your IT service. To offload routine tasks from IT support, you can create a self-service portal. Samanage offers this feature with full service catalog capabilities as it is ITIL-certified. The IT service catalog helps you define and publish accessible support services on your site. The catalog also blocks nuisance requests. Your IT support can document common issues and best practices in the knowledge base. This can reduce their workload. The knowledge base is backed by a stable ITIL-compliant backend. Samanage’s Service-Level Agreements (SLA) promise the following: deliver support commitments, track response time, measure performance, and set service targets and alerts. The SLA can be helpful for regular security checkups. Missed tasks send off warnings to alert the IT support. Other main features of the Samanage SLA are: problem management, setting of business hours, automated alerts, robust reports, and daily grading view. Samanage asset management can manage both hardware and software assets, and both parts or whole of the asset. There are more than 200 properties for the hardware depository such as CPU, sound cards, disks etc. Tagging makes it simple to define the item’s status, delegate it to users, and monitor its performance. The service desk also has a robust software repository. You can easily retrieve software details and detect unauthorized installation or security bugs. Samanage is ideal for large enterprises as it supports all major operating systems (Mac, Unix, Windows, iOS, and Android). Samanage also delivers warranty details automatically when you need it. Plus, it offers companies better visibility on incidents and issues. Samanage is an integrated solution that is designed for full ITIL compliance. Therefore, it is a suitable application for the service desk workflows of large companies. Since Samanage is a cloud service it is also suitable for small and medium-sized businesses. This provides businesses the agility to boost their support infrastructure to match growing needs. Pricing is offered based on the number of asset devices and support agents. Your price plan can be tailored to match your IT operations. What Problems Will Samanage Solve? Lack of reporting with little to no visibility into critical data: Samanage enables IT teams large and small to see into their IT organization as well as bring valuable insights to the organization as a whole. With the Samanage dashboard, admins can quickly see reporting around service requests, customer satisfaction, and the current status of pending tickets. With reporting, measurability, and insights from Samanage, IT is armed with the data that showcases the true value of IT to organizational leaders. Complex, clunky platforms that are not scalable: Using Samanage provides technicians with the agility to streamline business service requests and delivery processes from IT to HR to Procurement. As a SaaS application, Samanage believes in continuous improvement and utilizes the feedback from customers to improve its platform. With no “releases” or “versions”, Samanage updates the application with little to no interruption to service, providing users with quick time to value and a new pathway to the future of IT. High service cost and complicated implementation: Samanage offers an excellent service experience as it believes that its users should truly love the product they use daily. From the purchase process through the implementation of Samanage, organizations have the support of the Samanage team. Through the Samanage Community, phone calls, live chat, and social media, Samanage team members are literally just a click away to answer questions and accept feedback. Companies have unique needs and requirements and no software platform can be perfect in such a scenario. It is pointless to try to find an ideal off-the-shelf software app that fulfills all your business needs. The smart thing to do would be to modify the solution for your specific needs, worker skill levels, budget, and other elements. For these reasons, do not rush and invest in well-publicized trendy solutions. Though these may be widely used, they may not be the perfect fit for your unique wants. Do your homework, look into each short-listed system in detail, read a few Samanage reviews, speak to the maker for explanations, and finally select the app that presents what you want. How Much Does Samanage Cost? 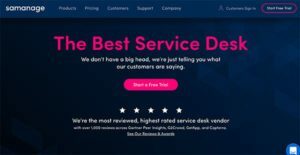 We realize that when you make a decision to buy Customer Support Software it’s important not only to see how experts evaluate it in their reviews, but also to find out if the real people and companies that buy it are actually satisfied with the product. That’s why we’ve created our behavior-based Customer Satisfaction Algorithm™ that gathers customer reviews, comments and Samanage reviews across a wide range of social media sites. The data is then presented in an easy to digest form showing how many people had positive and negative experience with Samanage. With that information at hand you should be equipped to make an informed buying decision that you won’t regret. What are Samanage pricing details? What integrations are available for Samanage? Pros: I love Samanage features like: SLA rules, Problem management, Reports and others. Their customer support is excellent, they are always ready for help and for providing additional trainings if needed. We always have a full picture of our progress. Cons: I love this software, but they need some improvements in every tool. I would like to schedule reports, and send them to some users or even groups. I like to show progress or alerts on my dashboards. I would like to have dynamic targets for SLA rules. Pros: Overall, the product is easy to use and does support the general ITSM/ITIL model, which is great for IT departments to follow. Setup is easy, and the general look and feel of the product is nice. There is some ability to customize the portal and emails, as well as add custom fields to each category form. Cons: There is an overall general lack of support for this product. Most times, when you call in for support, you get a super rude customer service rep who dismisses your issue, or you get a voicemail box. There is no call waiting queue, so if nobody answers or nobody is available, you go to a voicemail box and are at their mercy for a call back (rather than waiting on hold for the next available rep). They recently upgraded their phone system (as their reps tell me), which is very spotty/lots of quality issues and dropped calls. In addition, they announced dropping support for Linux, which is no good--especially if you are looking for one tool that works as an all-in-one tool to support your IT shop. They only want to support Windows. They also need to work on the back end of the product--there are many places where you have to set a setting twice to have the effect you are looking for (which you only discover when things aren't working as expected). Finally, they dump SSO on to third-parties, which have limited support. Their support team won't help if you're having issues with SSO, and neither will the third party, as neither "knows how the other product works." Both tell you to "contact the other company."